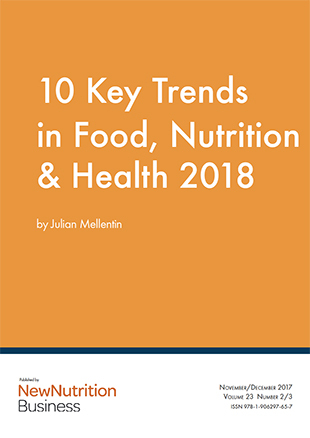 Every year we aim to entertain and inform our customers with the New Nutrition Business annual analysis of the Key Trends in the Business of Food, Nutrition & Health. If you want to know what trends will be creating opportunities and challenges for your business in the years ahead, you will find them here, as well as some practical advice about how companies are successfully responding to these trends – and what you can take from these for your own business. We produce 10 Key Trends as an antidote to the hundreds of trend lists that companies are bombarded with, in which the trends change frequently, with new subjects appearing one year and disappearing the next. This is not the case with NNB’s 10 Key Trends. 1. Will this trend endure? 2. Will it produce opportunities for profitable growth? Chart 17: Who is backing the meat substitute companies?